Late evening visit after a long day out. East London (ELB) - Cowcatcher 4.80 Great balance and perfect condition. East London (ELB) - Dandy Extra Pale Ale 3.80 Crisp, dry and very pale. Afternoon visit to this excellent pub. Volden beers were priced at £3.50 per pint. East London (ELB) - Mutiny 5.30 A copper-coloured, nutty Bitter with the addition of rum. A late one in here. Busy at lunchtime before the football. The clientele looked in rather better shape than some of the staff. Reunion - Trial Brew No. 7 PIA New Zealand Dark Beer 4.40 A very nice, fruity Porter with good hop levels. Lunchtime visit ahead of football at Brisbane Road. Reunion - Frost Fair 4.50 Dark and spicy. A group of five of us assembled on the doorstep for a very punctual 4pm opening and had a pint each before proceeding to Leyton Orient Supporters Club. This is a splendid well run pub and we had excellent service. A quick lunchtime visit. A bit of a queue to be served as I arrived just behind a large group. Tiny Rebel - You Snows It 4.20 Very pale, hazy. Hoppy. Quiet in the early evening but a lot of tables are reserved for quizzers later in the evening. Volden - Winter 5.20 A dry, bitter, roasty, Porter. Liquorice. Not bad at all. I arrive home after a long flight from South America to find the house cold and the cupboard bare. To the Technical then to eat whilst the place warms up. Five Points - Hook Island Red 6.00 Nice to see this beer back on bars. Reunion - Engage! 3.70 Golden, well-hopped and very bitter. 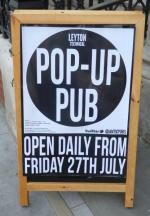 The pub is found in Leyton, Greater London, E10 5OJ. Initially this pub existed as a short-term ‘Pop-Up’ pub, open for the duration of the 2012 Olympic and Paralympic Games. Then closed for nearly a year, it re-opened on a permanent basis in August 2013. 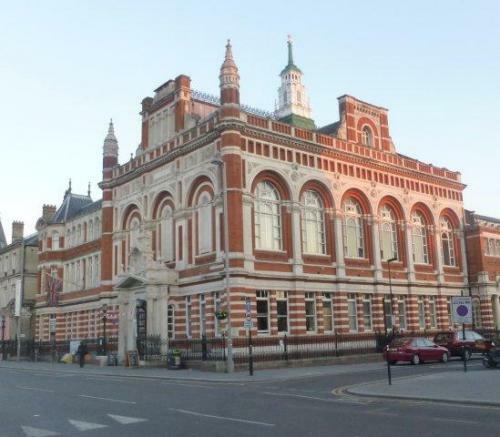 The pub is housed in part of the former Leyton Town Hall. It has several different rooms in which to drink, and the toilets are housed deep in the dungeons. 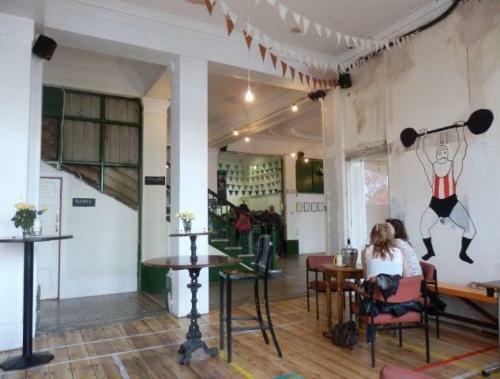 The interior of the pub is now very much more homely and comfortable than it appears in my early photo on this site from its pop-up days. We have visited this pub 102 times, seen 238 different beers and tried 129 of them.